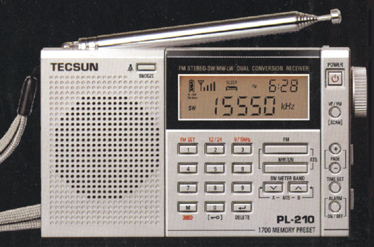 The Tecsun PL-210 is an affordable, double conversion, digital portable receiver that covers longwave, medium wave and shortwave from 1700 to 30000 kHz. It features 1700 memories, meter band indication, sensitivity switch, digital clock with alarm and sleep, lock key, and stereo FM to the earphone jack. The backlit display shows frequency, meter band, signal strength, battery condition, FM stereo icon, error codes and time in 12 or 24 hour format. Tune your favorite stations by turning the knob, selecting a memory, scanning or keypad entry. This radio includes: zippered carry case, stereo ear buds, wire antenna, wrist strap and manual. Requires two AA cells (not included). 4.75 x 3 x 1 inches. 125x75x26mm. Produced in black or silver finish. Silver version is shown above. Copyright 2012-2016, Universal Radio, Inc.